Brad Withrow-Robinson, OSU Forestry and Natural Resources Extension agent for Benton, Linn and Polk Counties. This year’s fires in eastern and southern Oregon, and especially California remind us that fire does not occur only in remote forest areas. It is common in rural areas, can affect farm lands, communities along the wildland-urban fringe, and can even cross the boundary into densely developed communities. 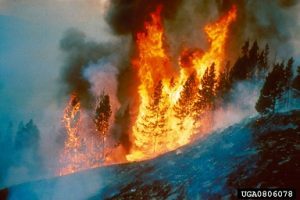 The scale and intensity of fires across the west are increasing for many reasons including historic land management and fire exclusion policies, development patterns and recent climate patterns resulting in many consecutive years of intense droughts. It is important for people in western Oregon to realize that we too live in a fire landscape, even though it is not as common as elsewhere in the state. Smoke has not been uncommon in the Valley and can be a significant health factor, even when from distant fires. Find more about fires and your health at the AirNow webpage . Evacuation Readiness should be on everyone’s mind. Even though it seems unlikely to many here it the valley, it needs to be thought of and planned for. As the last two years have demonstrated in California, an urban address does not guarantee safety. Yes, we’ve posted on preparedness before, because it matters. The final thing I’d encourage you to do is to commit to some long term actions to prevent and prepare for wildfire. There are many steps you can take to help keep your home and family safe in a fire-prone environment (which this is for several months each summer). There are many resources to help you learn about fires and your health, make an evacuation plan and identify actions you can take to make your home and neighborhood safer from fire. But where to start? We have collected information to help you address each of these things at the Forestry & Natural Resources Extension Fire Program website . Explore the Fire Adapted communities tab at the top of the page. This is a time to learn from the wildfire crisis elsewhere, and begin taking action to protect your home and family.